The idea of creating a “trail of murals” began when two Cedar Rapidians, Bob and Lynn Ocken, were visiting the small town of Seward, Alaska. 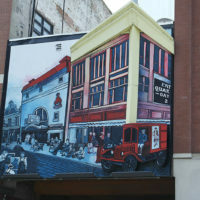 They discovered various murals telling the story of the town, its people and culture. 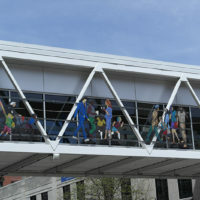 As they wandered from mural to mural, they became fascinated with the possibilities this concept could bring to the Cedar Rapids community, particularly after the devastation of the 2008 flood. Upon returning home, instead of forgetting about the idea, Lynn discussed the possibilities with many local organizations and community leaders. Lynn was met with so much enthusiasm and encouragement that she enlisted the help of others to move the idea to fruition to bring a trail of murals to Cedar Rapids. And now what once started as an idea in Alaska is being put into action in Cedar Rapids. 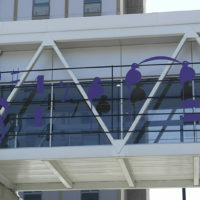 With the Ocken’s efforts and support of community members, the inaugural mural was unveiled in May 2012 in downtown Cedar Rapids. 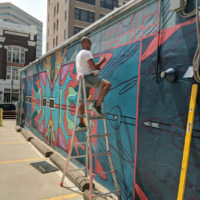 As an organization that is passionate about supporting artists, Murals & More aims to attract a diverse mix of talents to add unique character and exciting installations to our outdoor gallery throughout Cedar Rapids. If you would like to learn about future opportunities to participate as an artist, please submit your information to our artist database. We will contact you when you match as a potential good fit for future projects or when we send out an open request for proposal (RFP). 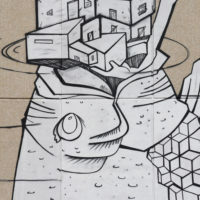 We are looking for building and property owners to partner with us and provide locations for our next pieces of artwork. Murals & More will work with you to identify an appropriate mural location and solidify your partnership with this important community project. Since building owners are an integral part of the Murals & More project, we need your help and commitment to make the project a true success. Your support will make a difference in the community and help engage the community with downtown. Murals & More is a grassroots, citizen driven organization. We need the community’s involvement to make the project a true success. Every individual who gets involved makes the project even more successful. Your volunteerism and support will make a difference in the community. Volunteering: We are always looking for dedicated volunteers in a multitude of areas. Whether you are a creative type who can assist with ideas for marketing or you are a hands on, organized personality, we are always looking for people who can provide their time and dedication. Contact us today to find out how you can help move our projects to the next level. Trail Development and Implementation Committee: Covers future trail development including locations, building owners, and themes, as well as all aspects related to the mural including budgets, materials, installation, lighting and recognition plaques. Artist Committee: Oversees all aspects related to artists including selection, communication, monitoring and negotiating. Marketing and Communication Committee: Provides ongoing, relevant and strategic outreach and communications to community on the society and mural projects. 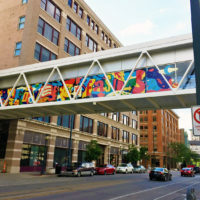 Event Planning Committee: Creates, coordinates and implements any and all events related to the mural project and assists all committees with their event needs. If you’re interested in learning about how you can be involved, contact us to set up a conversation. Donations: Join others in supporting Cedar Rapids Murals & More, allowing this exciting, community focused group to fund future projects. We are an approved 501(c)3 organization and your donation is tax-exempt. You can make a contribution online now or request a donation form via mail. Sponsorships: If you’re an organization who would like to partner with Murals & More by sponsoring our Student Art Walk or our Art Auction, please click here to contact us and we’ll reply as soon as possible.